Attached to this post are some of the stichera (verses) from the services of Matins and Vespers for the third week of Great Lent. They are taken from The Lenten Triodion, which is the special liturgical book used during this season of the year for our worship and edification. The verses chosen focus on how fasting, prayer, and practicing the Christian virtues are essential for our spiritual lives, which is being “refocused” during Great Lent. Attached to this post are some of the stichera (verses) from the services of Matins and Vespers for the second week of Great Lent. 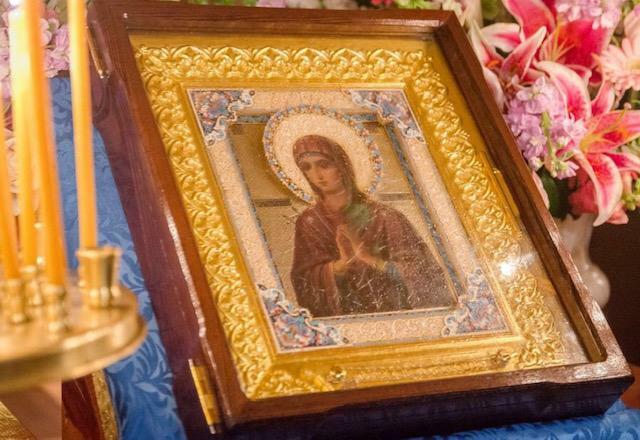 They are taken from The Lenten Triodion, which is the special liturgical book used during this season of the year for our worship and edification. The verses chosen focus on how fasting, prayer, and practicing the Christian virtues are essential for our spiritual lives, which is being “refocused” during Great Lent. Attached to this post are some of the stichera (verses) from the services of Matins and Vespers for first week of Great Lent. They are taken from The Lenten Triodion, which is the special liturgical book used during this season of the year for our worship and edification. The verses chosen focus on how fasting, prayer, and practicing the Christian virtues are essential for our spiritual lives, which is being “refocused” during Great Lent. “Let us abstain from every pleasure; through fasting let us enrich our powers of perception, and gladly let us drink the cup of compunction, as we sing: O ye works of the Lord, bless ye the Lord. This is a reminder that Monday, March 11 through Thursday, March 14 at 6:30pm we will be serving Great Compline and the Canon of St Andrew of Crete. Below is some edifying information about the Great Canon. Below are some of the stichera (verses) from the services of Matins and Vespers for Cheese Week, the week before the start of Great Lent. They are taken from The Lenten Triodion, which is the special liturgical book used during this season of the year for our worship and edification. The verses chosen focus on how fasting, prayer, and practicing the Christian virtues are essential for our spiritual lives, which is being “refocused” during Great Lent. The parable of the Prodigal Son is one of the most well known. Some of its expressions have passed into the ordinary, spoken language, while several illustrations and pictures relating to it are well known to us from childhood. A certain man had two sons: and the younger of them said to his father, Father, give me the portion of goods that falleth to me. And he divided unto them his living. And not many days after the younger son gathered all together, and took his journey into a far country, and there wasted his substance with riotous living. And when he had spent all, there arose a mighty famine in that land; and he began to be in want. And he went and joined himself to a citizen of that country; and he sent him into his fields to feed swine. And he would fain have filled his belly with the husks that the swine did eat: and no man gave unto him. And when he came to himself, he said, How many hired servants of my father’s have bread enough and to spare, and I perish with hunger! I will arise and go to my father, and will say unto him, Father, I have sinned against heaven, and before thee, and am no more worthy to be called thy son: make me as one of thy hired servants. And he arose, and came to his father. But when he was yet a great way off, his father saw him, and had compassion, and ran, and fell on his neck, and kissed him. And the son said unto him, Father, I have sinned against heaven, and in thy sight, and am no more worthy to be called thy son. But the father said to his servants, Bring forth the best robe, and put it on him; and put a ring on his hand, and shoes on his feet: and bring hither the fatted calf, and kill it: and let us eat, and be merry: for this my son was dead and is alive again; he was lost, and is found. And they began to be merry. Now his elder son was in the field: and as he came and drew nigh to the house, he heard music and dancing. And he called one of the servants, and asked what these things meant. And he said unto him, Thy brother is come; and thy father hath killed the fatted calf, because he hath received him safe and sound. And he was angry, and would not go in: therefore came his father out, and intreated him. And he answering said to his father, Lo, these many years do I serve thee, neither transgressed I at any time thy commandment: and yet thou never gavest me a kid, that I might make merry with my friends: but as soon as this thy son was come, which hath devoured thy living with harlots, thou hast killed for him the fatted calf. And he said unto him, Son, thou art ever with me, and all that I have is thine. It was meet that we should make merry, and be glad: for this thy brother was dead, and is alive again; and was lost, and is found (Luke 15:11-32). The parable of the Prodigal Son is inexhaustible. It contains such a multitude of themes, that it is difficult to enumerate them. Each man, who delves into it with reverence, finds the answer for himself to questions about his own spiritual condition. The first theme is historical – the theme of God’s chosen people and the pagans. The elder son in the parable could be an image of Israel, and the younger son that of the pagan nations. In the light of this parable, according to the words of Protopresbyter Michael Pomazansky, it is possible to clarify for oneself the significance of the Old Testament period, when men, having committed the original sin, withdrew from God. “The Father grieves over the departure of the beloved son. But, not infringing upon his filial dignity and filial freedom, He waits until the son himself, on having come to know all the bitterness of evil, and having remembered his past life in the Father’s home, begins to yearn for this home and opens his heart to the Father’s love. Thus it was with the human race”. The second theme is about the nature of sin. This is why the parable of the Prodigal Son is read at the Liturgy on the third preparatory Sunday before Great Lent, when the faithful are preparing themselves for cleansing from sins through the endeavor [podvig ] of repentance. Repentance is the third theme. Nowhere better does the Gospel disclose to us what the essence of repentance is, than, namely, in the parable of the Prodigal Son. It reveals to us the gradual, inner process of the sinner’s turnabout and the fullness of repentance, which consists of consciousness of one’s fall, sincere remorse and turning humbly to the Heavenly Father. The fourth theme is the Church and her liturgical life. This is spoken of in the Synaxarion for the Sunday of the Prodigal Son (a special instruction, which is read on this Sunday preparatory for Great Lent). The best robe, in which the father arrays the son who has returned, is interpreted in the Synaxarion as Baptism; the ring – as the seal of the Holy Spirit in the Mystery of Chrismation; the feast with the eating of the fatted calf – as the Eucharist, the Mystery of Communion. The music and dancing are the symbol of the Church’s celebration on the restoration of her fullness and oneness. The fifth theme that we encounter in the parable of the Parable Son is the Saviour Himself, Who appears here in the eucharistic image of the slaughtered calf, for, He is referred to in Scripture as the Lamb of God, which taketh away the sin of the world (John 1:29). The image of the elder son reveals the theme of envy, self conceit, legalism and the theme of the necessity for mutual, brotherly forgiveness. The younger, prodigal son is a symbol of all fallen mankind, and, at the same time, of each individual sinner. The portion of goods that falleth to him, that is, the younger son’s share of the property – these are God’s gifts, with which each man is endowed. According to the explanation of Bishop Ignatius Brianchaninov, these are “…the mind and heart, and especially the grace of the Holy Spirit, given to each Christian. The demand made of the father for the portion of goods falling to the son in order to use it arbitrarily is the striving of man to thrown off from himself submissiveness to God and to follow his own thoughts and desires. In the father’s consent to hand over the property there is depicted the absolute authority with which God has honored man in the use of God’s gifts”. Protopriest Alexander Men’, in one of his sermons on the “Sunday of the Prodigal Son”, mentions an interesting detail of an economic nature: “In those times, which the Lord is speaking about, people would try to live as one family. Nowadays, it is more natural for children to separate from and leave their parents when they grow up. Then, men jointly owned the land, which they worked together, and the larger the family was, the more working hands there were, the greater the ability to labor was. Therefore, to divide the home, to divide the property and the household was considered a detriment, a loss. If the children acted thus, it was considered an offense to the parents”. Having received his portion of the father’s property, the younger son departs to a far country, to a foreign land – a place of estrangement from God, where he ceases to think of his father, where he “lives riotously”, that is, gives himself up to a life of sin, which alienates a man from the Creator. There he quickly squandered the property, his share of God’s gifts – the powers of the mind, heart and body. This brings him to destitution – to complete spiritual desolation. This, too, is not surprising, for a man who has entered on the path of sin, follows the path of selfishness, of self-indulgence. He does not really control that which brings him momentary enjoyment; but that which gives him pleasure controls him. This is why the Apostle Paul warns Christians: I will not be brought under the power of any [thing] (I Corinthians 6:12). In this regard, one Church thinker has written: “…this far country, this foreign land reveals to us the profound essence of our life, of our condition. Only after having understood this, can we begin the return to real life. He, who has not felt this at least once in his life, who has never realized that he is spiritually in a foreign land, isolated, exiled, will not understand what the essence of Christianity is. And he, who is completely “at home” in this world, who has not experienced a yearning for another reality, will not comprehend what repentance and remorse are …Remorse and repentance are born out of the experience of alienation from God, from the joy of communion with Him …It necessarily includes in itself the profound desire to come back, to return, to find anew the lost home”. In the days preparatory for Great Lent – beginning with the Sunday of the Prodigal Son – the Church chants the psalm “By the waters of Babylon”, which reminds us of the bitter captivity of the Jews in a far country. This is a symbol of the captivity of sin, which alienates the Christian from God. But this psalm likewise speaks of repentance, love and return to the father’s home. Having dissipated his property, the younger son begins to hunger. In order not to die of starvation, he becomes a herder of swine – a swineherd. And he would gladly be sated with the swine’s food – “with the husks”, but no one would give to him. After lengthy sufferings, a saving thought awakens in him: How many hired servants of my father’s have bread enough and to spare, and I perish with hunger! The Prodigal Son could arrive at such a thought thanks to the fact that he had not succeeded in dissipating his final gift – the gift of memory of the father and the father’s home, in other words, the conscience (God’s voice within us). And here, just as after a serious illness accompanied by unconsciousness, consciousness returns to him, and he understands his calamitous situation. Then, there appears in him a resolve to forsake his sins and to repent, realizing, that by them he has offended the Lord; and, finally, in profound humility and in the consciousness of his unworthiness, always accompanied by sincere repentance, the sinner actually implements his resolution and returns to the father. Here it is necessary to remark, that outward calamities are often sent by God to sinners in order to bring them to their senses. They are God’s call to repentance. Bishop Theophanes the Recluse, who had expertly studied spiritual life, compares the sinner with a man sunk into a deep sleep, and in his turning to God he notes three psychological moments that correspond to what is indicated in the parable: 1) awakening from the sleep of sin (Luke 15:17); 2) the ripening of resolve to forsake sin and to dedicate himself to pleasing God (Luke 15:17-21); and 3) investing the sinner with power from on high for this in the Mysteries of Repentance and Communion. In this parable, which is multifaceted in its content and remarkable for the vividness of its colors, where, the image of the father of two sons stands for the Heavenly Father, the behavior of the Father – His goodness, which exceeds all human concepts, His love for the sinner and His joy on the occasion of the Prodigal Son’s return to Him – virtually occupies the main place. …when he was yet a great way off, his father saw him, the Gospel says to us; and this means that the father had been waiting and perhaps each day had been looking to see whether his son was returning. He saw him, and had compassion, and ran, and fell on his neck, and kissed him. The son started his confession, but the father did not even let him finish speaking; he already had forgiven and forgotten everything, and he receives the dissolute and starving swineherd as a beloved son. The father did not begin to require proofs of his son’s repentance, because he saw that his son had overcome shame and fear in order to return home. He commands his servants to give him the best robe, shoes and a ring on his hand. The ring is an indication of God’s gift to the forgiven sinner – the gift of God’s Grace, in which he is clothed for the salvation of his soul. According to the interpretation of Blessed Theophylact, the ring in the parable testifies to the restoration of the sinner’s unity with the earthly Church and the Heavenly. It is difficult to convey in words the fullness of the concept of God’s love toward fallen sinners. Perhaps no one gives us a glimpse of God’s love, which we read of in the parable of the Prodigal Son, better than the Apostle Paul in his First Epistle to the Corinthians: Charity suffereth long and is kind; …charity vaunteth not itself, ..is not easily provoked, thinketh no evil; rejoiceth not in iniquity, but rejoiceth in the truth; beareth all things, hopeth all things, endureth all things (I Corinthians 13:4-7). It is appropriate here to mention that sin, every sin, is a transgression against love and that repentance really can be accomplished only before the face of Perfect Love, for God is love (I John 4:8). It is especially essential to emphasize also the reason for the father’s joy: my son was dead and is alive again; he was lost, and is found, that is, he had been spiritually dead, living without God, and he had spiritually come back to life, having turned to life in God. In Sacred Scripture, returning to God is often presented as a resurrection from the dead (cf. Romans 6:13, Matthew 8:22, Revelation 3:1, Ephesians 2:1). Let us turn now to the image of the elder son. The elder son was displeased by the return of his younger brother and his reconciliation with the father. Here is how this is set forth in the parable: Now his elder son was in the field: and as he came and drew nigh to the house, he heard musick and dancing. And he called one of the servants, and asked what these things meant. And he said unto him, Thy brother is come; and thy father hath killed the fatted calf, because he hath received him safe and sound. And he was angry, and would not go in: therefore came his father out, and intreated him. And he answering said to his father, Lo, these many years do I serve thee, neither transgressed I at any time thy commandment: and yet thou never gavest me a kid, that I might make merry with my friends: but as soon as this thy son was come, which hath devoured thy living with harlots, thou hast killed for him the fatted calf. By the elder son, Jesus Christ implied, in the first place, the Pharisees and the scribes – the elders of the people, who, by their legalism, had been hindering the people from coming to Him. But to an equal extent this image applies to us all, to our mutual relations. The elder son was not at fault before his father, he had not actively sinned before him until his sinful brother returned. The return of the prodigal brother evoked in the elder brother envy – this terrible sin, which led to the first human murder and to the murder of the Saviour Himself. In the house of the Father (an image of the Church) there is joy, exultation – the exultation of the angels over one sinner that repenteth, but this joy remains outside the soul of the elder son. The father invites the elder son to enter into this joy, but he chooses the path of calculations, the path of legal considerations and contracts. Such cold, juridical attitudes always prevail wherever love dries up. The utterances of the elder son indicate that he did not really value his father’s gifts, which he made use of. He did not appreciate them because in his soul there was a void more fearful than that which we saw in his brother before his repentance. The elder son had stifled the voice of his conscience. We all, to one degree or another, in one period of our life or another, behave like the sons of the compassionate father. By our sins, we all alienate ourselves from His love. The service for the Sunday of the Prodigal Son reveals to us the state of alienation from God: “I have wasted the riches which the Father gave me; I have spent them all and now am destitute, dwelling in the land of evil citizens…”. And so, the Prodigal Son was in such a state for a long time, and, finally, the Gospel parable says, “he came to himself”. What does “he came to himself” mean? One Holy Father says that the beginning of our salvation self-knowledge. But, after all, self-knowledge is a lifetime pursuit, it is that toward which a man strives throughout the course of his whole existence. The meaning of this saying is disclosed by the Holy Fathers, who say that until you have come to know who you are; until you yourself have sensed the image of God in yourself; until you, living amidst earthly citizens, have felt that you are a citizen of heaven and have been enslaved to “foreign citizens”; until you, living amidst the filth of your own soul, have come to know the image of God in yourself – until then you have not entered on the path of salvation, you have not yet begun your salvation. It begins from the moment when you come to know your own divine nature. Thus it was also with the Prodigal Son. In one instant he perceived that he is living enslaved in a foreign land and does not possess genuine, real life. Having begun with knowledge of himself, a man, going further along this path, contrasts in himself that which is in him from God’s image, although it be covered with the sores of sin, to how he lives. And from this moment he begins to thirst for life in God and for cleansing from the sores of sin in the name of God’s image. A monk came to Venerable Antony and began to ask that he forgive and have mercy on him. Antony replied to him: “Neither I, nor God will have mercy on thee, if thou wilt not have mercy on thyself”. At first glance, the response seems strange. How is this so? For spiritual life, this is the greatest truth. Until I myself discover the image of God in myself; until I myself have mercy on the inner man who is in the abyss of sin, but possesses the image of God; until I myself have mercy on God’s creation in myself; until in my conscience I have mercy on myself, who am sinful, defiled and prodigal, that is, until I take pity on my immortal soul – until then, God also will not have mercy on me; until then, my entreaty will also be in vain. So this state of the Prodigal Son, who saw how badly he is living and how well they are living who are not even sons, but hirelings of his father – this is the state of having received mercy. He had mercy on himself and then went to God and began to beg for mercy from Him. It is necessary to take from the Patristic experience that which it gives us; otherwise, our requests for mercy will be in vain. We must sense in ourselves the image of God, the remnants of Divine beauty that are in us, although they be distorted, and, first of all, have mercy on ourselves and understand who we are in life and who we are in creation. In life, we are sinful, living in a “far country”, constantly forgetting about God, while in creation we are the image “of God’s ineffable Glory” and only in Him do we live, only in Him is our salvation. And this contrasting of oneself in creation with oneself in life also leads at a certain moment to the state of having mercy on oneself. Here is the meaning of Venerable Antony’s words. And if we at some moment of our life will have mercy on ourselves and will feel the contrast between ourselves in creation and ourselves in life, then we can, like the Prodigal Son, go to God and beg for mercy. We must renew the image of God in ourselves; we must understand that our sole business on earth is to make ourselves, who are citizens of the earth, into citizens of heaven. If God’s creation – the image “of God’s ineffable Glory” – is constantly before our eyes, then we shall have mercy on ourselves. This does not mean that we shall be proud, shall forgive ourselves, shall justify ourselves; but we shall see in ourselves an ineffable temple of God’s Glory, we shall perceive all the joy of life in God and experience that filth in which we live. Then we shall come to God and shall beg Him, as the Prodigal Son: “make me as one of Thy hired servants”; and we shall be received, as the Prodigal Son. Written by M.C. Steenberg (Bishop Irenei of Richmond – ROCOR). The words by which the preparatory weeks for the fast of Great Lent are begun, speak of a paradox. ‘He who exalts himself will be humbled, and he who humbles himself will be exalted’. As these words are proclaimed in our churches throughout the world on the first Sunday of the Triodion, commonly known as the Sunday of the Publican and the Pharisee, we have just come from hearing another paradox proclaimed in the same Sunday’s epistle: ‘Yes, all those who desire to live godly in Christ Jesus will suffer persecution’ (2 Tm 3.12). Humbleness brings exaltation, the pursuit of godliness brings persecution; and so we turn our eyes toward Lent. The Publican’s cry, ‘God, be merciful unto me, a sinner!’, is a phrase not uncommon to the Orthodox world. Indeed, it is partially in reference to this Scriptural passage that the words of the Jesus Prayer in its most common form can be attributed; and in the form of the Prayer, the words of the tax collector are thus uttered by many of the faithful hundreds, if not thousands, of times in their own lives. But what of these words that we pray? ‘God, have mercy on me’ is a petition of unequalled frequency in the Church’s worship and prayer. Countless litanies embrace it as a refrain, prayer services and memorials beg it repeatedly, and there are portions of the Offices in which it is said in sequences of three, twelve, forty or even fifty. It is the one phrase that many of the faithful, no matter how limited their linguistic knowledge otherwise, will know in all three of the Church’s great traditional tongues: Lord, have mercy. Kyrie, eleison. Gospodi, pomilui. The words are simple, yet powerful. To beg God’s mercy is a grave and awesome mystery in its own right, for the mercy of God is the foundation of the universe. We are made bold to ask for nothing less than that gift which goes beyond all comprehension and understanding, that gift by which the very planets and the stars have their being and we mortal humans have our breath. There is no little content to this cry. But the Gospel for this Sunday does not speak so much of what the words of the tax collector say, but what they do not say. His prayer is not recounted until we have heard the words of another man, the Pharisee, one of the order of great religious teachers in the late Jewish world, the righteousness of whom must nonetheless be exceeded by anyone entering the Kingdom of Heaven (Matthew 5.20). It is, interestingly, this Pharisee’s prayer that abounds in words, in things said. ‘God, I thank Thee that I am not like other men–extortionists, unjust, adulterers, or even as this tax collector. I fast twice a week; I give tithes of all that I possess’. The Pharisee has made what might have seemed a reasonable prayer, if we strip away for a moment its uncharitable tone. He is not an extortionist, and gives thanks to God for this fact. He keeps justice, for which fact he again offers thanks. Nor is he an adulterer, nor a tax collector, the latter group being one known for fraud, deception and theft, especially of the poor and misfortunate. He keeps the fasts. He offers of his wealth in tithes to the temple. He seems in every way ‘religious’. But his prayer has said too much, has revealed something of him that he certainly did not intend, yet which is nonetheless true. It has made objects of the elements in his religious life, and thus shown that he does not understand their true and deeper purpose. He has judged another, even if in seeming ‘justice’, and thus brought judgement upon his own head. His ascesis has made him proud, and thus not only failed to serve its intended end, but counteracted it altogether. And from the very outset, the Pharisee’s prayer has set him apart from his brethren. ‘God, I thank Thee that I am not like other men’. Prayer, which by engendering union with God thus ought in purity to make men one, has been twisted into a divisive act that rends men apart. Still, we must not judge the Pharisee. We must not hear the words of the Gospel and inwardly cry, ‘Thanks to Thee, O God, that I do not pray as he did!’, for then, by another great paradox, we pray exactly as he did. The holy Gospel does not recount the Pharisee’s prayer that we may see how other, poorer men pray, but that we may see with objective perspective how we pray. Though we may be more familiar with the words of the Publican, we must admit with pained heart that, of the two men, the Pharisee is far more like unto our own selves than the humbled and humble tax collector. As with so much of the mystery that is God’s gracious revelation in the Scriptures, we find that this story is our story. It is not only the Publican and the Pharisee, two long distant and removed figures, who go to the temple to pray, but we ourselves who approach God’s great mercy. And it is we who stand and proclaim, whether in our moments of prayer or in the activities of our daily lives, that ‘we are not like other men; we are just; we are not adulterers; we fast; we tithe; we are faithful’. And it is to us that the loving Lord Jesus proclaims: ‘Everyone who exalts himself will be humbled’. ‘Boastful am I, and hard of heart, all in vain and for nothing. Condemn me not with the Pharisee, but rather grant unto me the humility of the Publican, O only merciful and just Judge, and number me with him’ (Great Canon, Ode 4). It is this message that the Gospel for this Sunday means to instil in our hearts: not that we pray like the Publican, no matter how often we may recite his words; but that we pray like the Pharisee–that we are proud and haughty, and therefore must be humbled. The tax collector is not our associate but our example, the one whom we are to follow and strive to emulate. ‘Grant unto me the humility of the Publican’. The Pharisee is he who speaks of us, but the Publican he who speaks to us. ‘God, have mercy upon me’ must be the words of our prayer; but they cannot be purely our prayer whilst we still pray that ‘we are not like other men’, that we are ‘just’. Justice is far from us who are, as the tax collector proclaimed, sinners. We have no weight with God, no claim to His grace. We have only the ability to come before Him and beg His mercy exactly as we are. Lent is coming. In three weeks, the Vespers of Forgiveness will see in the fast proper, the actual period of ‘joyful sorrow’ that marks the journey into Pascha. But even now the Church begins to situate herself into that spirit which is necessary for joy, for sorrow, for repentance: the spirit of humility which can only come as our pride is brought low and in the depth of our hearts we realise that there is no other cry which mortal man can make in the presence of his King than the words of the humble collector of tax: God, be merciful unto me, a sinner! (This year Orthodox Great Lent starts March 11. On Sunday, February 10, Orthodox Christians will commemorate the first of five Pre-Lenten Sundays. We will hear in Church the lesson concerning Zacchaeus, the chief of the tax collectors, from the Gospel according to St. Luke, chapter 19, verses 1-10. The following is a sermon given on Zacchaeus Sunday by Metropolitan Anthony Bloom, on January 20, 1991). In these weeks of preparation for Lent, we were faced last Sunday with the story of Bartimaeus to attract our attention on our own blindness; our spiritual blindness of which we are not aware, while physical blindness is so clearly perceived; but also on the fact that if we want to recover our sight, our spiritual vision, our understanding of self, of God, of our neighbor, of life, there is only one Person to whom we can turn – it is God, our Lord Jesus Christ. Bartimaeus had tried all means to recover his sight, but it is only when he turned to Christ that he did recover it. (The story of the blind man is read on January 20 of this year). Whether we have taken advantage of the past week to reflect deeply on our own blindness, and in the darkness to begin to see some light, I do not know; each of us will have to answer for his eagerness or his laziness. But today we are confronted with a new parable, or rather, a new story of the life of Christ: the story of Zacchaeus. This story speaks to us again directly and the question which is been asked from us is this: What matters to me more? The good opinion of people around me, that people should not jeer at you, laugh at you because you are seeking to see God, to meet Him, or the necessity, the inner call to discover everything provided you can see Christ face to face? Is vanity stronger in us or the hunger for God? Saint John of the Ladder says clearly that vanity is contempt of God and cowardice before men. What is our attitude: are we prepared to discard everything, provided we can meet God – or not? And in our circumstances it is not so much people who will prevent us, people will not jeer at us, they will not laugh at us: they will be totally indifferent; but this does not mean that we like beggars do not turn to them, hoping for their approval, and in order to receive this approval, turn away from our search, from the only thing that can heal us and give us new life. Also, we will find within ourselves conflicting voices, saying, “Don’t! Don’t make yourself ridiculous! Don’t single yourself out by a search which is not necessary; you have got everything… Zacchaeus was rich; Zacchaeus was known as an honorable citizen – so are we! We possess so much, we are respected – are we going to start on a road that will make us into what Paul calls ‘the scum of the earth’, debase us?” This is the question which today’s story of Zacchaeus says to us: is vanity, that is the search of things which are vain, empty, and the fear of other people’s opinion that will prevail, or (will it be) the hunger each of us has, at times, acute for a meeting with the living God? Amen.